Last semester was the first time LectureMonkey was in use by real students. There were a number of key lessons learned that are being incorporated into the soon to be released version 3.5. Lesson 1 – Students really liked, and benefitted, from our recorded lectures. We sometimes joked that, if nothing else, we created an exam schedule predictor. By looking at usage statistics we could see peak usage around the time of an exam. Usually over half the class reviewed the recordings, most reviewing only parts. Students used the system for a variety of reasons – but the most prevalent use was to review material before exams. Most students viewed the lectures on the web not the iPhone. Lesson 2 – It was harder then expected to get students to record. The main issue was the need for a holder that would point the camera towards the front of the room. Even though there are many good, cheap phone stands available (see my previous post on iPhone stands), not everyone has one – also room geometry, seating location and desk space can be an issue. 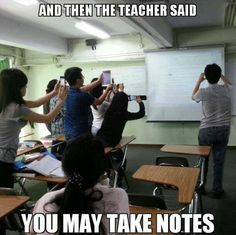 Lesson 3: Students are used to making audio recordings of their lectures. They also used to taking images of the important slides and boards using their phones. They want everything combined. 1. Indexes to important points for review in a lecture. Those lessons led to the creation of a new mode for LectureMonkey – capture mode. Capture mode enables students to easily join together and create a group capture of a lecture – without the need for a stand for the phone. LectureMonkey lets you know if someone is already recording nearby and lets you join the ongoing recording by combining your audio, images and comments to the group effort. The first user can decide whether to do full automated recording (just like before) or a more lightweight capture. Other students can join in using capture mode. In capture mode LectureMonkey each student captures a high quality audio recording and lets students take images when they raise and point the phone at the board in landscape. Students can also easily add comments by picking up the phone and texting. Everyone involved benefits twice – they get a personal slide show of the lecture made up of their audio recording, images and comments – but they also get a copy of the group effort – a combination of everyones images, comments and a combined audio track that starts when the first student started recording and ends when the last student has left. When class is over, LectureMonkey collates all the audio, images and comments by all participants and creates and shares the merged crowd sourced lecture with the participants.